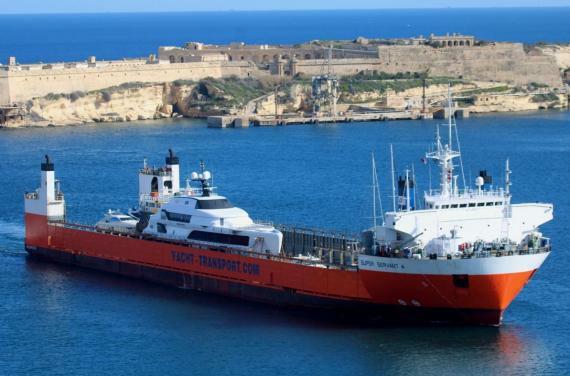 Maltese members, O&S Shipping has once again welcomed the semi-submersible heavy load carrier, Super Servant 4 to Valletta to carry out the delicate task of floating the 102tn flybridge cruiser, M.Y. Esmeralda of the Seas, before sailing to the Caribbean and dropping anchor in the Everglades in Florida, USA. This was the second time O&S have worked on the Super Servant 4 which has recently been given an overhaul. Before receiving the vessel, they arranged all the required preparation work but on the day of the operation heavy rains posed various challenges that put the team to the test. 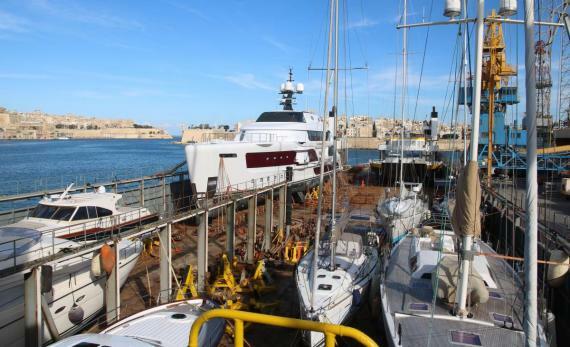 Managing Director, Kurt Camilleri explains; "A few years ago we helped float a Sunseeker 116 Yacht off of the Super Servant 4 (SS4) at Malta Freeport. The Super Servant 4 has been back once more for a similar operation, but this time the object of its mission was to float an 102tn MCY 96 Flybridge Cruiser (M.Y. 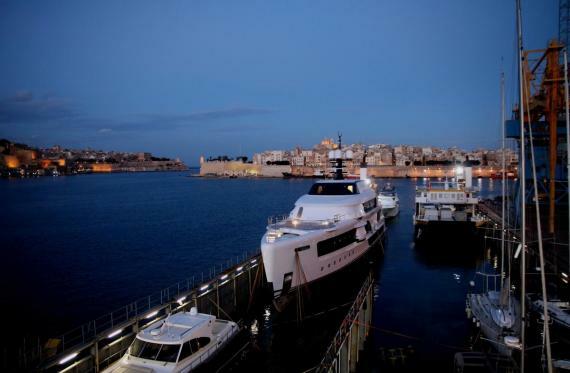 Esmeralda of the Seas) and ship it off from Valletta harbour to the Caribbean seas. The heavyweight beauty is the result of the fine craftsmanship of Monte Carlo Yachts and she was on her way to her final port of destination in the Everglades, USA. Prior to commencing the actual operation, we promptly made sure we had all bases covered in terms of permits and paperwork. Our package for such tasks includes customs clearance and pratique as well as other preparation work such as coordination of the arrival of the vessel and arrangements for berthing. We also line up all required equipment including tugs and stevedores and enlist the right men for the job. For this operation, our team included four welders and six divers. On the day of the operation, the SS4 docked at Valletta. Before we could start floating on the Esmeralda, there were other vessels sitting on board the SS4 that needed unlashing. Once completed, the SS4 began to submerge and take in water and we proceeded to float the Esmeralda on and into its stowing place. It was then the divers turn to intervene and they carefully followed the Esmeralda, setting up stands and lashing in preparation for the de-floating before making way for the welders. However, the welders did not have it easy at all as heavy rain started which added an extra layer of difficulty to their task at hand but they got the job done without a hitch and the SS4, loaded with the Esmeralda and other yachts, was good to sail off. See below for photos of the operation at Valletta Port. For those who aren't familiar with the vessel, the Super Servant 4 was designed in 1982 and is a semi-submersible heavy load carrier that makes use of a complex ballasting system which allows it to sink partially, load or unload heavy floatable cargo, and re-emerge, before sailing off for long-range navigation. The loading and unloading is known in the industry as floating in/on and floating off respectively. The type of cargo the SS4 usually carries ranges from oil rig equipment to smaller vessels like yachts. When carrying yachts, it bounces back and forth along the transatlantic route between the Mediterranean to the United States and Caribbean during different yachting seasons, allowing patrons to enjoy some good-weather seafaring. It is necessary as such yachts are not customarily equipped to handle such long navigational routes which would heavily burden their engines with unfittingly long operational hours. Other factors taken into consideration also include fuel and crew expenses and insurance as well as heightened storm and accident risk factors. The Super Servant 4 has only recently been serviced, refitted, and given a full tune-up to ensure it was in top-notch shape and in keeping with industry standards." A perfectly handled and successful operation from the O&S team!